Aedes de Venustas fragrance and perfume list. Aedes is a niche perfume boutique founded in 2005 by Robert Gerstner and Karl Bradl, located in New York City. Fragrance brands they carry include L'Artisian Parfumeur, Santa Maria Novella, Diptyque, and Serge Lutens. 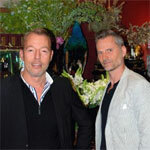 They launched a namesake fragrance in 2009 with L'Artisan perfumer Bertrand Duchaufour, and their signature scent in 2012 with the same perfumer. Karl Bradl is also part of the Nomenclature perfume line.